I'm getting sick. I can feel it. Tomorrow I'm gonna feel like absolute garbage, but for today I can still taste and smell perfectly. So I better get this review done now. I like to keep a consistent schedule on this website so I usually write reviews about a week before they're released just in case something comes up. This one is written two weeks ahead of time because, judging by how long my daughter was sick and how long my wife has been sick, this virus might take awhile. But when this review is released and the next one comes out just a few days later, there will be an entire illness in between that you wouldn't even know happened. I'm a planner. I also share too much. Olsen Perri's winery is in San Diego and their grapes are from various places in the Central Coast, but they're totally old-school. Founders Will Perri and Mark Olsen took a trip to Burgundy where they saw how Burgundian wine was made before modern technology, and they decided to do just that in California. They use a manual Italian basket press, gravity pumps, and ferment with natural yeasts. This California Pinot is made OG style. 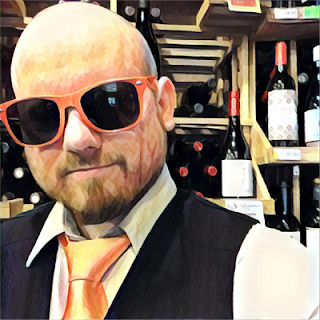 Santa Rita Hills is in Santa Barbara, Santa Barbara is in the Central Coast, the Central Coast is the most confusing appellation in all of California. Normally I spit during reviews but I think there's gonna be some consumption going on tonight. You know, for its medicinal properties. And no I'm not joking. After that last review, I decided to listen to music that is actually good this time. It's a rare Pandora night and my subject will be David Bowie. The first song is "Golden Years" and I agree with the track decision. Time to taste some wine and rock out to the Thin White Duke. I love the package of the wine. It's in a fat Burgundy bottle, the label is simple in design, fancy in font, and overall classy. The back label says it has a 13.73% ABV. That's oddly specific. The Pinot is of the Calera Clone (Calera is not the same thing as cholera). It spent ten months in 50% new French oak and only 74 cases were produced. The wine is ruby red in color with a thin clarity. HOLY AROMAS, BATMAN! Just by the nose my mouth started salivating, I swear to Zod! There's very explosive aromas of lilac, chocolate, cherries, incense, and sandalwood. This nose isn't delicate at all! It's LOUD! And it's one of those wines that I like to describe as "I could smell it all night, not have a sip, and be completely satisfied." Classic Joey. I need new material. In the mouth it's savory and medium bodied. The acidity is high and the tannin is sweet. There's flavors of raspberries, mocha, cherry cola and copper. It finishes with raspberries, mocha and... is that Captain Crunch? Yeah, that's Captain Crunch. The savoriness and mocha has me thinking there may be a little Syrah in here but I really don't think so. This is a high quality Pinot Noir that's also fun. It's serious but doesn't take itself too seriously. Does that make any sense? Hmmm... how else should I put it... it's delicious raspberry juice with intriguing complexities and I would recommend it for the asking price of $45. How's that? 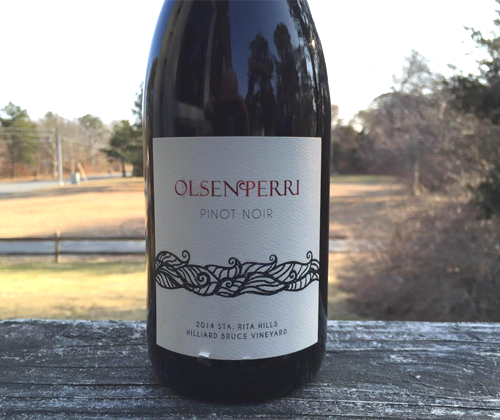 I've also reviewed Olsen Perri's L'Apache Pinot Noir so be sure to check that out. 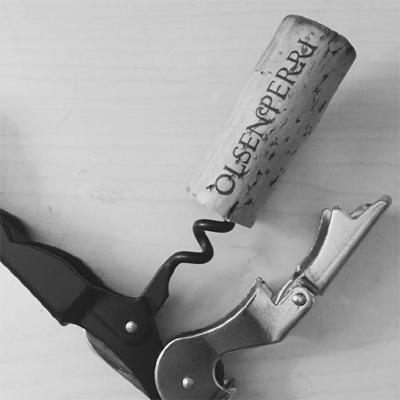 So from what I hear Olsen Perri is currently working on a kickass website at OLSENPERRIWINES.COM but it won't be up for another month. So I'll update this review when it's running and I'll let you guys know over social media! Patrick puts it somewhere else.